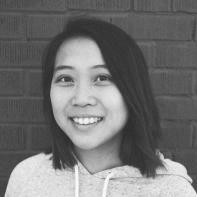 Jody Chan is a writer and organizer based in Tkaronto/Toronto. They are the poetry editor for Hematopoeisis, a 2017 VONA alum, a member of the Winter Tangerine Workshops Team, and the 2018 winner of the Third Coast Poetry Contest, selected by Sarah Kay. Their first chapbook is published with Damaged Goods Press. Their work has been nominated for a Pushcart Prize and is published in BOAAT, Looseleaf Magazine, Nat. Brut, The Shade Journal, and elsewhere. when she wants to teach him a lesson, calls it love. who delivers dinner to the door. I call my stepmom Auntie, shush my inner 餓.
into my mom’s skillet, calls it love. the ink under long pants when I visit dad. fasts overtime for you. who more do you want. let me hold your next daughter, 餓鬼 begs. let me give her my name.